You are here: Home / Contests / Win Steelers tickets! 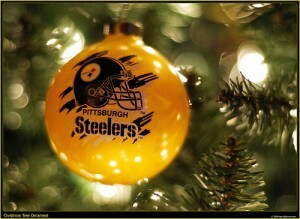 Have you ever dreamed of celebrating Christmas Eve with the Steelers? If so, this year you might be able to make that dream a reality. Longstanding high-end Downtown retailer Larrimor‘s is giving away two tickets to the December 24th game against the St. Louis Rams! To enter, all you have to do is visit Larrimor’s on Facebook, become a fan, and leave a comment on their wall answering the following question: In a dream world, what one person would you bring with you to the game and why? Larrimor’s will provide the tickets, but can’t guarantee your dream guest. Fans are already dreaming up the perfect game next to their best friends, military husbands and in one case Johnny Depp. The winner will be selected at random, but why not be creative with your answer? There’s no harm in dreaming! Entries will be accepted until Wednesday, December 14th at noon. The winner will be announced on Thursday, December 15th on Larrimor’s Facebook page. Good luck!